September 22nd marked the official first day of Fall, and I (admitted defeat, bidding a woeful adieu to summer) celebrated by cutting all of my basil, parsley and chives down to the ground. When one has grown a ton of basil and parsley over the length of an entire summer, it only makes sense to prep some pesto and tabouli. A few glances at the interwebs and a quick dash to the Wedge Co-Op for fresh tomatoes, garlic, green onions, some walnuts and quinoa, and I was ready to begin. First I made the pesto. I stripped all of the leaves from the stalks and chopped the leaves using my mini Cuisinart food processor, then I chopped the walnuts, crushed the garlic and shredded the parmesan-reggiano. I mixed everything in a big glass bowl and then added half a cup of olive oil. That’s it! It was lover-ly. For more blow-by-blow, this is the recipe I used from Simply Recipes. The big white pieces are broad, flat shreds of parmesan…mmm… A little pesto goes a very long way when mixed into pasta. 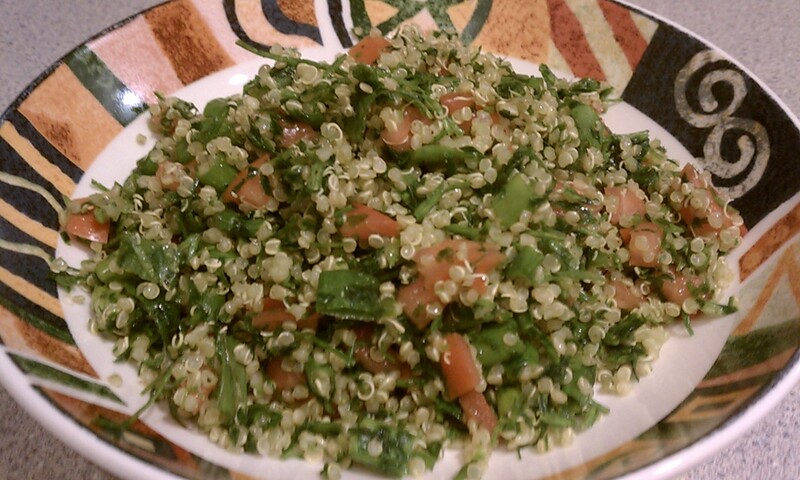 I used this recipe from greatpartyrecipes.com to make the Tabouli, but I made a couple of changes. Instead of the gluten-containing bulgar I used quinoa, I skipped the mint because it was exorbitantly-priced, and I left the cucumber out because I somehow lost it between the checkout line and home, and I didn’t feel like going back out to buy another. 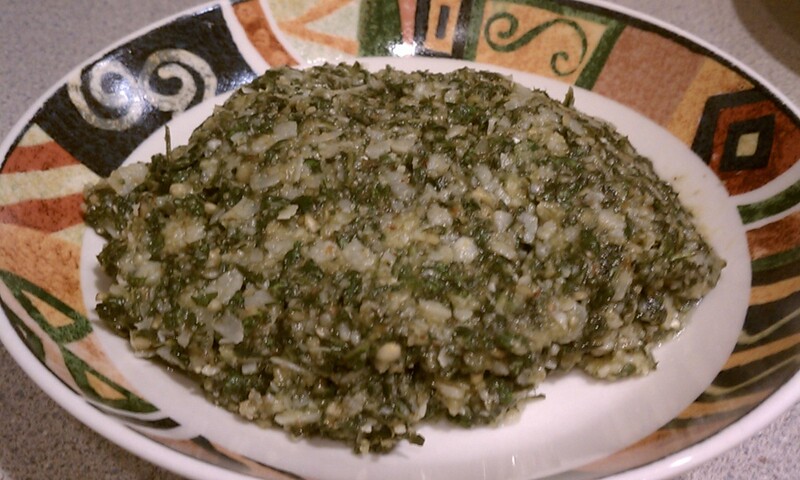 I started cooking the quinoa and then chopped the parsley – stems and leaves – in the food processor. I diced tomatoes, minced the garlic, and sliced the green onions. Once the quinoa cooled a bit, I mixed everything together and finally added the olive oil, lemon juice, salt and pepper. It was also lover-ly and simple. 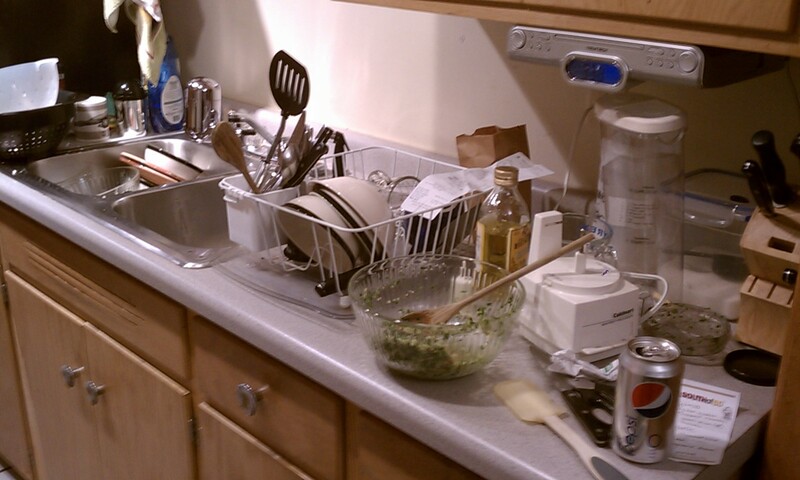 Afterwards, the kitchen looked like this. I was done with cooking for the evening, so I threw a little of the extra quinoa on a plate, mixed in some pesto, added a side of tabouli and had a loverly (if quite herby) dinner.